Fixes frozen or unresponsive gestures on Mac OS X by restarting the dock. This is known as “killing the dock” and it’s harmless. None of your running applications will quit or be affected. The dock will disappear, restart, and then re-appear. OS X Notification Centre support giving you a notification when the gestures have been fixed. Download the Mac OS X Gestures Freeze Fix extension. Next, install the extension via Alfred Preferences -> Extensions. Drag and drop the downloaded “Mac OS X Gestures Freeze Fix.alfredextension” over the area in the screenshot shown below. 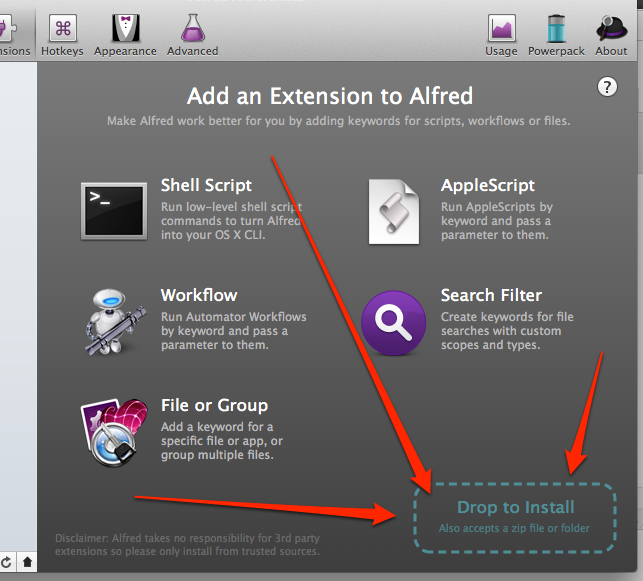 Installing an Alfred extension. Drop it in the green box. To use, simply pull up Alfred and type “FrozenGestures” and hit enter. You’ll see something similar to the screenshot below before hitting enter. Gestures are fixed by calling “FrozenGestures” and hitting enter.